Eucalyptus sideroxylon, showing fruit (capsules) & buds with operculum present. Eucalyptus sp in East Gippsland, Victoria, Australia, showing ‘ribbon’ bark form. Eucalyptus (Greek, eu, well; kalypto, to cover as with a lid: the petals and usually also the calyx-limb fused and covering the flower before anthesis, then falling off in the form of a lid, or cover). Myrtaceae. Gum-tree. Mostly trees, frequently of immense size, a few of the alpine and sub-alpine species shrubby, much grown in California and the Southwest for their ornamental value, as windbreaks and avenue trees, for fuel, and especially for their timber. Leaves simple, entire; in the seedlings and on young shoots of many species horizontal, opposite, sessile, and cordate; in the adult mostly vertical, alternate, petiolate (rarely opposite and sessile), and varying from roundish to lanceolate-acuminate and falcate; always rigid, penniveined, glabrous except rarely on the young shoots, sometimes covered with a glaucous wax: fls. white, rarely yellowish or some shade of red, in umbels of 3 to many, rarely solitary, the umbels solitary and axillary for paniculate or corymbose; calyx-tube obconical, campanulate, ovoid. or oblong, adnate to the ovary at the base; petals and calyx-lobes connate, forming a lid, or cap, which separates from the calyx-tube by a circumscissle dehiscence; lid sometimes plainly double, the outer cap then derived from the calyx-limb, the inner cap from the petals; stamens numerous; anthers small; style undivided: fr. a caps, partially or wholly inclosed in the adherent calyx-tube, opening at the top by 3-6 valves; seeds numerous, small, mostly angular.—About 300 species, all native of Austral, and the Malayan region. Related to Angophora and to Syncarpia, but distinguished by the absence of distinct petals. The genus Eucalyptus was monographed in part by Baron von Mueller in his Eucalyptographia (cited here as F. v. M. Eucal. ), in which 100 species are illustrated (1879-84). The genus is now receiving exhaustive treatment by J. H. Maiden in his "Critical Revision of the Genus Eucalyptus," appearing in parts, with numerous plates. This author also furnishes the best information regarding the uses and timber of the various species, in his "Native Useful Plants of Australia." Bentham described 135 species in his "Flora Australiensis," vol. 3 (1866). The Australasian Association for the Advancement of Science published a very useful key by J. G. Luehmann in 1898. The most exhaustive American work on the genus is United States Forestry Bulletin No. 35, "Eucalypts Cultivated in the United States," by A. J. McClatchie. University of California Agricultural Experiment Station Bulletin No. 196, by Norman D. Ingham, is a practical guide for planters, with descriptions of the more important species. The United States Forest Service, the California Station, and the California State Board of Forestry have all issued smaller bulletins on this subject. Inflated claims have been made for eucalyptus culture, and authentic publications should be secured if one contemplates planting them extensively. Eucalyptus is a group adapted to semi-tropical and warm temperate regions. But few species are really hardy. E. globulus has been very widely distributed over the globe through the persevering efforts of the late Baron von Mueller; it is frequently planted in the malarial regions of warm climates, as at the Campagna at Rome, with very beneficial effect. (Sanitarians will be interested in "Eucalyptus in Algeria and Tunisia, from an Hygienic and Climatological Point of View, by Edward Pepper, Proc. Amer. Phil. Soc. 35:39-56.) In England, the same species is grown extensively for subtropical gardening, on account of its distinctive glaucous hue and symmetrical growth, but in that climate it needs the protection of glass in winter. This is by far the most important genus of timber trees introduced into California. The ordinary blue- gum, E. globulus, has been grown in large numbers and is still the favorite for general planting. Its hard and durable wood is replacing oak and hickory to some extent for insulator pins, wheel-wrights' work, flooring, tool-handles, and furniture. Although pale in color, it takes a good polish, possesses a beautiful grain, and is readily stained. Furniture made from blue-gum wood and properly stained has every appearance of mahogany. The chief drawback to the use of eucalyptus for lumber is the tendency of its logs to end-check while curing, thus involving considerable waste. As a windbreak and fuel tree it is unsurpassed, since it is of rapid, erect growth and the timber is easily split. 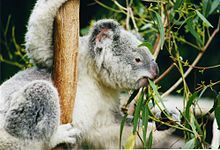 Its foliage has been distilled in large quantities for the oil it contains, practically all of the eucalyptus oil now sold in the United States coining from home-grown trees. In addition to the blue-gum, E. rostrata and especially E. tereticornis are grown for railroad ties, piling, interior finish and furniture. E. resinifera is a hardy eucalypt yielding a good timber not so liable to check as that of some others; it has been but little grown in America thus far. E. corynocalyx is a good drought- resistant species for districts with mild winters, and its wood is of the best. E. crebra will grow under a greater range of conditions than perhaps any other and is especially suited to the hot and dry interior valleys. Other drought-resistant eucalypts are E. microtheca and E. polyanthemos, while the most resistant to frost are E. crebra, E. rostrata, E.tereticornis, E. globulus, E. viminalis, E. rudis, E. robusta, and E. resinifera. The species most cultivated as ornamentals are E. ficifolia, E. leucoxylon., E. sideroxylon var. rosea, E. Risdonii, E. erythronema and E. polyanthemos. Persistently repeated accounts of heights ranging from 325 to 500 feet for certain eucalypts are erroneous, as indicated under E. amygdalina var. regnans. Although the eucalypti are not exclusively, and some species not even prominently horticultural, yet because of the great general interest attached to them and because of their varied uses, it is thought best to discuss them rather fully in this Cyclopedia. Culture of eucalyptus in California. The following directions for the propagation of Eucalyptus are adapted very largely from Bulletin No. 196 of the California Experiment Station, entitled "Eucalyptus in California, by Norman D. Ingham (1908). The necessary conveniences for the propagation of XXXIX. the seedlings are: seed-boxes or flats, a good soil, seed true to name, plenty of convenient water, and in most localities shade for the young plants. The seeds of most species may be gathered at all times of the year, although the greater amount mature during the summer and fall. The seed-cases should be gathered from the trees when the valves begin to open and placed on sheets of canvas in the direct rays of the sun, which will open the valves, allowing the seed and chaff to fall out. The number of fertile seed to the pound is very high; the average number of transplanted plants raised to the pound is 12,000. Eucalyptus seed will germinate and grow in nearly any soil but the best results are secured when the seeds are sown in a light loam, while a medium loam mixed with about one-quarter well-rotted horse- manure should be used in the transplanting flats. The time to sow the seed varies somewhat with the locality, but as a general rule the seed should be sown in May or June and the seedlings from these sowings will be large enough to be set out in the field the following spring, if they receive proper care while young. The seed is usually sown broadcast in the seed-flats and the young plants transplanted once before being set in the field. Some persons take the trouble to sow one seed in a place and space them in the flats; by this method transplanting is unnecessary. Others sow the seeds in hills and practise thinning, instead of transplanting before setting out in the field. This last method is used in the warmer districts with good success, because of the great trouble experienced in transplanting during the hot summer months. Whichever method is used, fill the flats to a depth of 3 or 4 inches with the prepared soil, pressing it down firmly in the boxes, then sow the seeds and cover them to a depth of about ⅛ inch with the same soil, sand, or sawdust, pressing this covering firmly over them. The seed- flats should be kept damp through the heat of the day, until the young plants break the ground, then care must be taken not to use too much water and that there is a good circulation of air over the flats, or damping- off is liable to occur. This disease can be prevented by using practically no water on cloudy days and only in the mornings on clear days. If the seeds are sown broadcast in the flats, when the young plants have reached a height of 2 to 3 inches, they can be transplanted to other flats of prepared soil and spaced from 1¼ to 2 inches apart. The beet results in transplanting are secured if the plants are hardened-off for a few days beforehand by checking the water supply, allowing them to become quite dry. The soil into which the young plants arc tranplanted should be kept damp, and the plants should be protected from the direct rays of the sun for a few days. The lath-house or the screens are necessary to supply shade for the young plants and will also protect the seeds in flats from the ravages of birds and the young plants from the frosts during winter months, before the time for setting in the field. The time to set the plants in the field varies with the climatic conditions or localities and whether the plants are to receive irrigation or not. In localities in which frosts are common through the winter months, it is advisable to set the trees put as early in the spring as possible without endangering them to a late frost and still have them receive the benefit of the late rains, so that they will have a full season's growth to withstand the frosts of the following winter. If the trees are to be irrigated, they may be set out later in the season without danger of loss from want of moisture. To insure a good stand, the plants should not be under 6 or over 20 inches in height when set in the field; to a certain extent, the smaller the plants when set out, the better the results afterward, although the size varies somewhat with the species and the locality. In many species the roots are as long if not longer than the plant's own height above ground. This is a family of plants that will not stand a large amount of mutilation to the root-system; consequently better results are secured from setting out small plants. If the soil is heavy rich loam, the trees may be planted as close as 6 by 6 feet apart unless irrigation is to be practised. In the latter case, 4 by 8 feet would be the right distance, thus leaving an 8-foot space for plowing out the irrigating-ditches each year. If it is a lighter soil on which the planting is to be made, 8 by 8 feet is the proper distance, or 6 by 10 feet, if irrigation is to be practised. The close planting has a tendency to sacrifice the diameter growth in favor of the height, also making more erect trees and forming a perfect canopy with their crowns that will shade the soil, nearly preventing evaporation, as well as any vegetable growth on the forest floor. Close planting matures a greater number of perfect trees, and is especially recommended when straight poles are desired. The plants should be blocked out in the flats before being brought into the field, by drawing a sharp knife between the rows. If care is taken to set out the young plants with this small amount of soil around the rootlets, the shock caused in transplanting is reduced to a minimum. Each planter should carry a trowel, to make the holes that are to receive the young plants at the intersection of the marked -lines. These holes should be of such a depth that the plants can be set from ½ to 1 inch lower in the soil than they originally were in the flats. Each plant should have the soil pressed firmly about it and receive a small amount of water, unless the soil is moist from recent rains. In order to provide a mulch, thus checking evaporation and also to kill the weeds, cultivation should be conducted in the new plantation as long as possible without danger of injuring the young trees by driving a horse between them. The plantings generally may be cultivated for the first season and part of the second before the limbs of the trees spread out and interlap so that it is impossible to drive between the rows. It is an acknowledged fact that the only way to secure a good stand, and give the trees a start, is to cultivate and take care of the plantings from the time of setting out. However, a number of groves have been set out on land that is too hilly or rocky to cultivate and the trees have made fair growths. Thinning of the young trees is an important practice, as it is not good management to set out just the number of trees that one expects to mature. A planting upon any good soil may with advantage be set out 6 by 6 feet apart (1,210 trees to the acre), and at the end of the first year a rigid thinning should be started, removing with a grub-hoe all weak, inferior, or injured trees. This thinning should be conducted until only the strong and healthy trees, or a certain number, remain to the acre. By this method some trees will stand at the original distance that they were planted, while others will stand at multiples of that distance. The extra cost of close planting will never be noticed when the largest possible stand of healthy trees is guaranteed, which is practically the case under this method. If thinning is carried out by a set plan, removing every other one or two trees, many strong and healthy trees will be sacrificed. All limbs that have a tendency to deform the trees should be removed each year. After the third or fourth year, the trees will have grown to such a height that to remove the limbs may prove impractical in most cases. At this period (the fourth or fifth year) there enters a new problem: the removal of the poorer trees for wood and stakes to allow the remainder a larger area of soil to draw upon and a greater space above ground to extend their branches. At this time the trees on an acre can be reduced to a certain number, leaving these to grow for telephone poles, ties, and lumber, or the entire grove may be cut for stakes and wood. Second-growth eucalyptus.—In three to six weeks after the trees have been felled, the sprouts will start out from the stumps. These sprouts are produced in abundance and if properly thinned will soon replace the cut forest, thus providing a second growth of fuel or timber in much less time than was required with the original grove. These remarks apply probably to all species of eucalyptus, certainly to all sorts experimented with in California up to the present time. Taxonomy of the cultivated eucalypti. All of the keys used for the identification of species are more or less artificial. No satisfactory natural classification has yet been devised. While the following key is designed to aid in the making of determinations rather than to express relationships, species known to be closely related are placed near each other in the text so far as this can be conveniently done. For the ready determination of species in this critical genus, it is necessary to have adult leaves, buds, flowers, and mature fruit; immature fruits are often very misleading. Allowance should always be made for extreme forms, since only normal specimens are here described. This applies particularly to size of leaves. Unless otherwise stated, the leaf description is drawn from foliage on mature stems. The juvenile foliage, i.e., on young seedlings and on suckers, is usually very different, the leaves often broader, blunt, sessile, and of a different color. E. annulata, Benth. Shrub or small tree with characters of E. cornuta, except as follows: Lvs. narrow-lanceolate, acuminate: lid 6-8 lines long, usually incurved: fr. depressed-globose, 4-5 lines thick, the convex rim protruding as a thick rim.—E. Bosistoana, F. v. M. Next to E. pilularis in the key but perhaps related to E. melliodora. Lvs. narrow-lanceolate, copiously dotted, of equal color on both sides; veins very divergent: fls. few and pedicelled in the umbels: peduncles somewhat compressed; lid fully as long as tube, narrow-hemispheric: fr. small, with narrow rim; valves inclosed. Maiden, Crit. Rev. Eucal. 49 (figs. 1-1).—E. californica, used by Abbot Kinney in his book entitled "Eucalyptus," has not been recognized by botanists: also listed as E. occidentalis var. Californica, Kinney.—E. cinirea, F. v. M. Related to E. viminalis. Bark persistent, fibrous: Lvs. opposite. sessile, cordate, more or less white-mealy: fls. 3-7, pedicellate: fr. 3 lines thick, with protruding valves.—E. dealbata, A. Cunn. Small tree, near E. viminalis: Lvs. glaucous, often broad and obtuse: fls. 3-6, small: fr.-rim flat; valves protruding even before they open. Cult. in Cuba.—E. Deanei, Maiden, very close to E. saligna: distinguished chiefly by its broad sucker Lvs.—E. Foeld Bay (? ), Naudin, is a horticultural form either of E. rostrata or of E. tereticornis: branchlets pendulous.—E. jugalis, Naudin, is a cult. form not yet identified. —E. Maidenii, F.v.M. Appearance and bark of E. goniocalyx but peculiar warty buds and caps of E. globulus: branchlets quadrangular.—E. McClatchie, Kinney, is a horticultural name for the large-fld. form of E. Gunnii var. acervula.—E. miniata, A. Cunn. Placed after E. ficifolia in the key: fls. sessile in simple umbels, brilliant orange-color: fr. truncate-ovate, nearly 2 in. long. F.v.M. Eucal. 6:4.—E. Mortoniana, Kinney. is a horticultural species probably referable to E. Maideni. Maiden, Crit. Rev. Eucal. 79 (figs. 13-14); 80 (figs. 1-12).—E. patens. Benth. Next to E. pilularis in the key: peduncles only slightly flattened, bearing 3-7 fls. : lid hemispherical, short-pointed, about half as long as tube: fr. truncate-ovate, 5 lines wide; rim narrow; caps. sunk. F.v.M. Eucal. 9:5.—E. phaceafolia, listed by Richter in Calif. Exp. Sta. Bull. No. 217, p. 1011, is probably a misprint for E. ficifolia.—E. pinnata, a garden name. J. U. Maiden suggests that Californian specimens under this name may be E. coccifera (Crit. Rev. Eucal., p. 143).—E. rubida, Deane & Maiden. Characters of E. viminalis. but bark always smooth and white, often with reddish patches, and the sucker lvs. broad.—E. uncinata, Turcz. Near E. decipiens in the key and, like it, a shrub: bark deciduous, smooth: Lvs. very light green, narrow, copiously dark- dotted; veins fine, widely divergent: filaments kinked; anthers opening by terminal pores: fr. 2-3 lines across; valves little if at all exserted. F.v.M. Eucal. 4:10. Maiden, Crit. Rev. Eucal. 62. —E. urnigera. Hook. f. Shapely tree with drooping branchlets and glaucous bluish foliage: bark smooth, pale brown: Lvs. 2-4 in. long, obtuse: fls. mostly 3 in each umbel; peduncles often recurved: fr. nearly globose but somewhat urn-shaped, 4-5 lines wide: caps. much sunk and valves inclosed. Maiden Crit. Rev. Eucal. 80 (Figs. 13-15). Eucalyptus forest in Victoria. Mostly Eucalyptus albens (white box). This tree in Heathcote National Park has a serious problem. w:Eucalyptus. Some of the material on this page may be from Wikipedia, under the Creative Commons license. This page was last modified on 27 September 2009, at 15:24.